Fraker Fire Protection Inc. is a full service testing, repair and installation company that specializes in fire sprinkler systems . We cater to private residencies, apartment buildings as well as commercial and industrial fire sprinkler systems Los Angeles County, Ventura County, Orange County and the Inland Empire. Our testing, repair and installation services for fire sprinkler systems meet the requirements of the National Fire Protection Association (NFPA) and the Authority Having Jurisdiction. NFPA requires that all fire sprinkler systems be serviced on a regular basis to ensure safety and protection should a fire occur. All of our fire sprinkler services comply with state and local fire department requirements. Our service personnel are properly licensed and certified to perform any inspections, testing or repairs on fire sprinkler systems. Fraker Fire Protection holds the required licenses issued by the State Fire Marshal and the Contractor’s State Licensing Board. 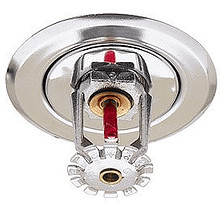 We service and maintain all fire sprinkler systems according to NFPA 25 and Title 19 code requirements. The State of California Fire Marshal and local Fire Departments require a “5-Year Test” to be performed on all fire sprinkler systems by a qualified C-16 licensed Fire Sprinkler contractor. NFPA 13 requires fire sprinkler monitoring for systems that have more than 100 sprinkler heads. A central station facility is used for monitoring. They dispatch the Fire Department and/or to the service provider. Fire Sprinkler Systems are highly effective fire protection measures that use water and pressure. The licensed professionals at Fraker Fire Protection Inc. are required to perform sprinkler inspections in accordance with NFPA 25. They are qualified to inspect all types of fire sprinkler systems. Regular Trip tests of dry pipe, pre-action, or deluge valves. Fast Response: Sprinkler systems have a prompt response time when a fire occurs due to their detection of fire or heat. New home sprinklers are now available and react very quickly to fires. Low Cost: Sprinklers are affordable to install and maintain and they help save thousands of dollars in property damage. Dramatic Results: Fire sprinklers are largely effective for their ability to extinguish a fire before it gets out of hand.